...... - e.g. HTTP, HTTPS, FTP ports and system & software such as CPU usage, % Registry in-use or any performance counter. Errors written to log files & Event Logs and available disk space can also be verified. 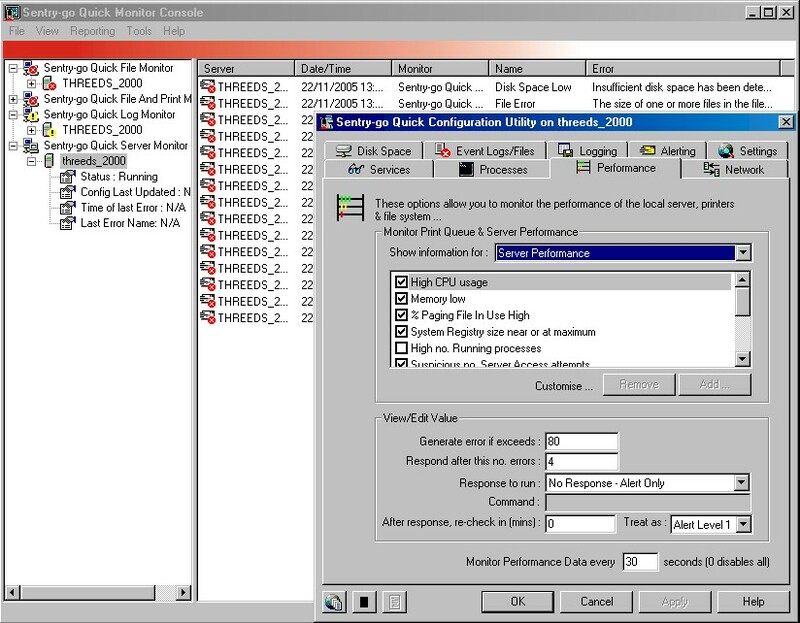 When errors are detected, the Quick Monitor can either respond automatically (e.g. restart a service, run a command or job), send alerts (e.g. network message, e-mail etc.) or both. Using it's embedded web server, web reports can also be accessed from your desktop. The Quick Monitor Console can also be used view alerts, configure or synchronise settings, or access web reports. SentryPC provides you a good way to control and manage your PC. Qweas is providing links to Sentry-go Quick Server Monitor 6.2 as a courtesy, and makes no representations regarding Sentry-go Quick Server Monitor or any other applications or any information related thereto. Any questions, complaints or claims regarding this application Sentry-go Quick Server Monitor 6.2 must be directed to the appropriate software vendor. You may click the publisher link of Sentry-go Quick Server Monitor on the top of this page to get more details about the vendor.